Beautifully renovated 2 bedroom top floor apartment with a furnished south facing terrace offering knockout views of the town and countryside. 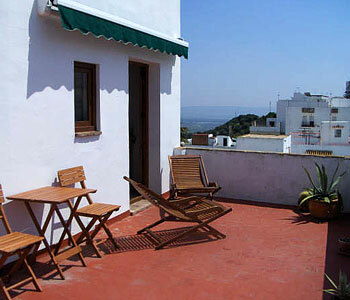 Located in the historic old town and walking distance to locals shops, bars and restaurants. Decorated to a high standard mixing contemporary with Moorish style the apartment is split over 2 levels offering a cosy, comfortable living space on the first floor and an incredibly light, spacious area on the top floor. On entering the apartment there is a large living room with built in morrocan style seating area. The main bedroom is located off the living room and the second bedroom and and modern stylish shower room leading off of this. Upstairs is a sizeable fully fitted kitchen/dining room with doors opening out onto a large roof terrace providing some of the best views of the town and surrounding area. The terrace is equipped with barbecue, dining table and chairs and deckchairs. It is ideally located for the Easter Bull run which takes place along the street below. Precioso apartamento de dos dormitorios con terraza amueblada que ofrece increíbles vistas del pueblo y los campos del alrededor. Está situada en el casco antiguo del pueblo, muy cerca de los bares, restaurantes y tiendas del pueblo. Decorado con una fusión de estilos entre contemporáneo y marroquí, el apartamento consta de dos plantas, la primera planta es muy acogedora y confortable y la planta alta es muy espaciosa y luminosa. El amplio salón, situado en la primera planta, cuenta con sofá de obra estilo marroquí. El dormitorio principal se encuentra contiguo al salón y a su vez da al segundo dormitorio y a un cuarto de baño moderno con ducha. En la planta de arriba está la cocina-comedor, grande y muy bien equipada con puertas que abren a la amplia terraza y a las increíbles vistas, de las mejores del pueblo y los alrededores. La terraza cuenta con barbacoa, mesa y sillas y tumbonas. Se encuentra situada en una posición privilegiada para ver el Toro Embolao correr por la calle en la que está situada la casa.